Sleek tailpiece lines grab the eyes with their sporting looks. 152 hp delivered smoothly by the R power unit charm the ears with their racing accent. "R" CHASSIS: The Monster 1200 R features a racing derived frame structure that uses the engine as a stressed element. This structure is composed by a compact Ducati trellis directly fixed to the cylinder heads and by the engine itself; the shock-absorber and the rear sub-frame are also connected to the engine. 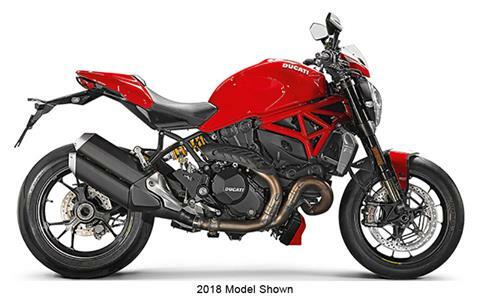 The Monster 1200 R features a dedicated rear frame, with a lighter structure design; the upper tube is in continuity with the profile of the tank while the lower escapes and hides as soon as possible under the volume of the seat. The passenger foot pegs support, are no longer integrated in one piece with the rider ones, but separate and directly fixed to the sub-frame. The "R" chassis set-up is rised by 15 mm to achieve a lean angle of 50° that make the bike ready for race track. ÖHLINS HIGH-SPEC SUSPENSION: The racing inspired chassis geometry is matched with Ø 48 mm Öhlins usd forks, fully adjustable in spring preload and precisely adjustable in compression and rebound damping. At the rear the "R" uses an Öhlins mono-shock with integrated piggy-back, fully adjustable in spring preload with full adjustment and highly engineered control of compression and rebound damping. The Öhlins mono-shock is fixed on one side to the vertical cylinder head, mounted on the opposite side to a strong Ducati single-sided swing-arm. This exemplary suspension maintains tyre contact and ensures feeling and finesse even under extreme riding conditions. ÖHLINS CROSS-MOUNTED STEERING DAMPER: The Monster 1200 R comes standard with a cross-mounted Ohlins steering damper to further enhance the stability of the bike and to reduce the risk of headshake when riding aggressive. Moreover it adds a plus to the sporty look of the cockpit. 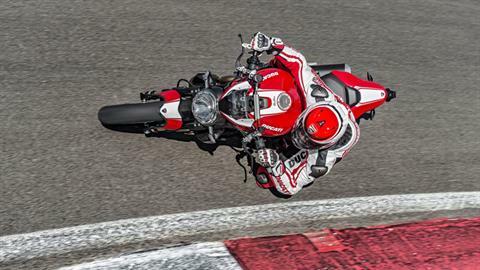 BREMBO BRAKE SYSTEM: The Monster 1200 R is equipped by a Superbike-spec brake system. It is equipped with the same brakes found on the 1299 Panigale, which deliver stunning performance; a racing oriented PR 16 brake pump manages top-level Ø 330 mm discs, which are gripped by the state of the art Brembo M50 Monobloc radial callipers that use MotoGp derived technology to be powerful yet compact and lightweight. A single Ø 245 mm disc in the rear is gripped by a two piston calliper, also by Brembo. POWER AND TORQUE: The "R" engine version delivers a wide spread of power and torque with a peak of 112 kW (152 hp) and 125 Nm (92 lb-ft) @ 7,750 rpm of torque for great performance and fun. At low, medium engine revs the "R" has a strong responsiveness with the 75% of maximum torque already available at 3500 rpms. 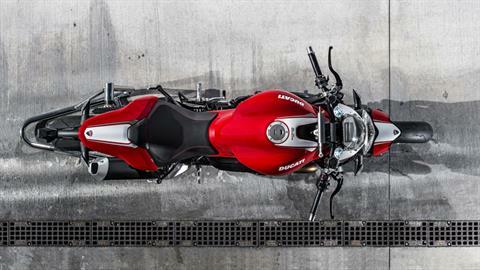 EXHAUST SYSTEM: The "R" engine version is coupled via Æ 58 mm pipes to an impressive side-mounted 2-1-2 staggered shotgun exhaust that makes no secret of the performance of which the Monster 1200 R is capable. The bigger in dimension silencer to be Euro 4 compliant has a sport and “mechanical” design, consistent with the "nerve" forms of the tail. The engine management system dedicates a lambda probe to each header, providing precise fuelingwhile an electronically controlled mid-section valve optimises exhaust pressure throughout the rev-range. RACING AESTHETIC: The tailpiece is aerodynamic, pointing upwards, while the seat - one single piece for rider and passenger - is shorter and slimmer. The licence plate holder, fixed in a high position, means the 200/55 tyre is clearly visible, mounted on a three-spoke forged wheel. ATTENTION TO DETAILS: The aesthetics of the Monster 1200 R are completed by the screen and longitudinal graphics inspired by the classic Ducati Corse band. The exclusiveness of this model is also reflected in the attention to detail, for example the metallic radiator covers with R graphic obtained through sanding. ERGONOMICS: The dimensions of the Monster 1200 R offer more space even to taller riders. The sporty riding style is enhanced with separate passenger footpegs that offer more space when riding, pushing on ones toes and lengthening the knee towards the ground. 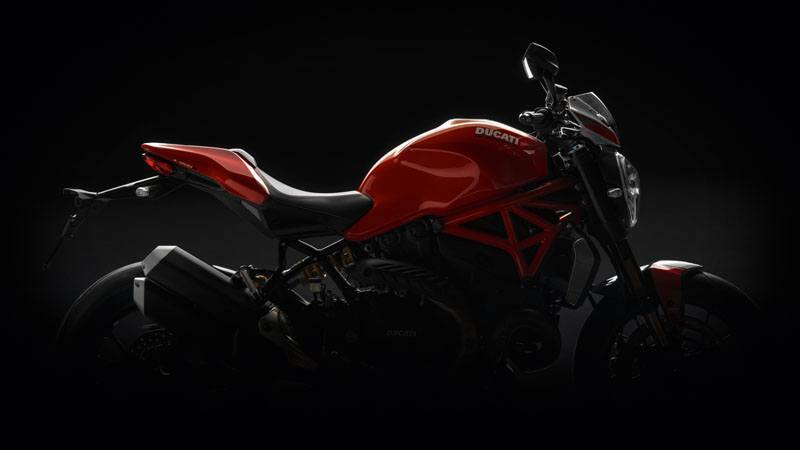 REFINED MATERIALS: The personality of the Monster 1200 is emphasised by the forged wheels, created in alloy, forged and then machined. The front mudguard, in carbon fibre, and footpeg supports, in forged aluminium, help contribute to a total dry weight of just 180 kg. 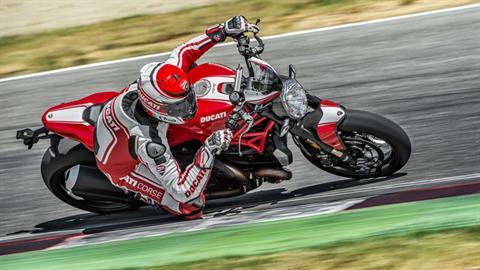 RACING PERFORMANCE: The 1200 cc Ducati Testastretta 11° DS “R” version engine is a meticulously designed gem of modern engineering. This has resulted in a power unit that ensures exhilarating performance, with full, vigorous delivery throughout the rev range, providing enhanced riding pleasure and full-power enjoyment whatever the riding conditions. 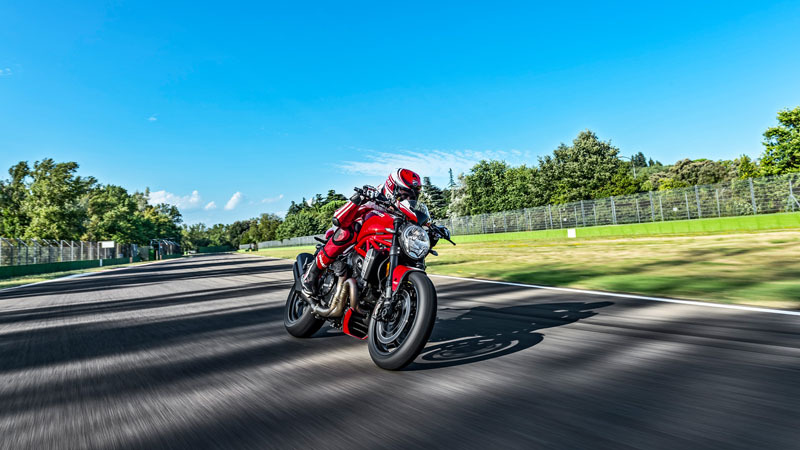 An engine perfectly suited to the dynamic characteristics of the Monster 1200 R, putting out a whopping 152 hp and 12,7 kgm of torque at 7,750 rpm. The gearbox is a 6-speed unit that works in concert with a wet multiplate slipper clutch with selfservo system to ensure comfort and total riding control. 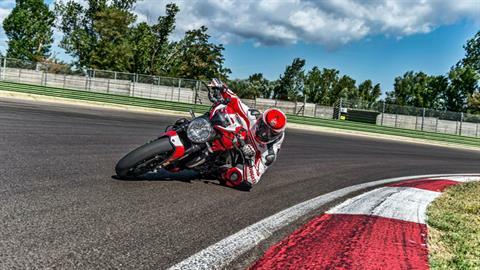 RIDING MODE: The Monster 1200 R incorporates the very latest innovative Ducati technologies, including the famous Ducati branded Riding Modes. 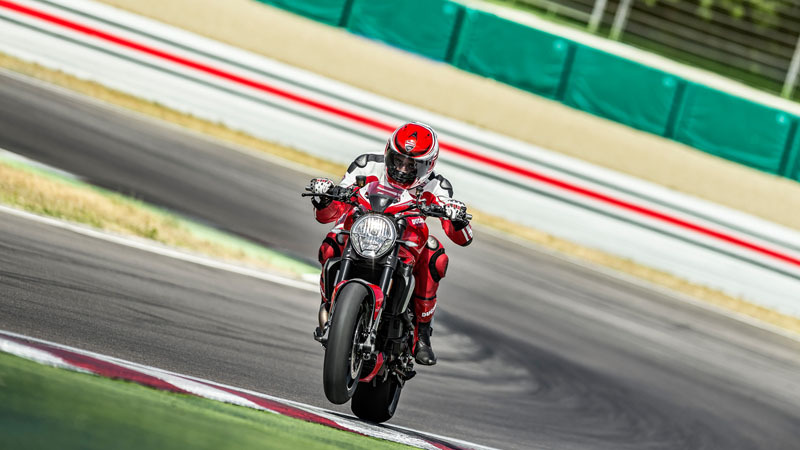 The three Riding Modes (URBAN, TOURING, SPORT) are enabled by combining class-leading technologies such as: Ride-by-Wire (RbW), Ducati Traction Control (DTC), multi-calibration 9MP ABS and the graphics on the instrument panel. The rider can change the character of the bike by selecting from the left-hand switchgear - even while riding - among three different pre-set configurations (Riding Modes) that best adapt to the riding style or riding conditions. The Riding Modes make it possible to instantly modify the power delivered by the engine (RbW), the activation levels of DTC and ABS, and the graphics on the instrument panel. The Riding Modes are factory pre-set in each of the three parameters, but can be individually customised and saved to suit the rider. A "default"option is available to easily return all settings to factory pre-sets. 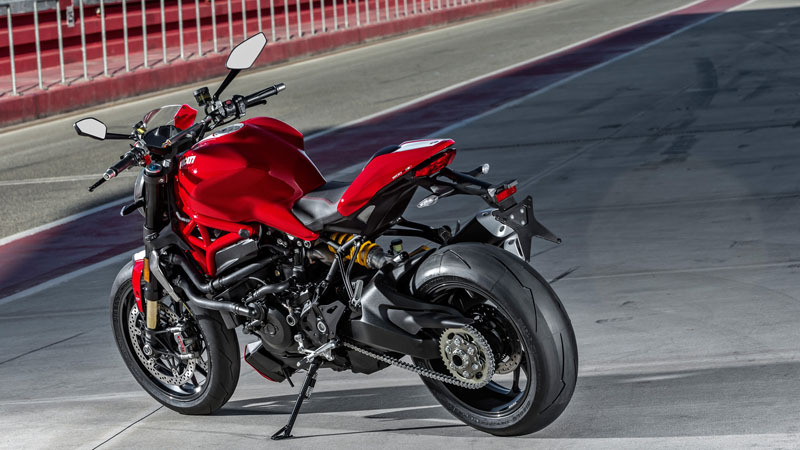 LIGHTING SYSTEM: The front view of Monster 1200 R is dominated by a round headlight flanked by the forks, underlining the authentic and powerful Monster-line. The headlight itself is a modern unit with support in magnesium that uses a bulb light for high-low beam functions, and LED technology for the two position lights placed at the sides The fully integrated tail light is fully LED. The front and rear side indicators are with bulbs. In EU markets, the Monster 1200 R also features LED turn lights. Both versions are equipped with a license plate LED light. 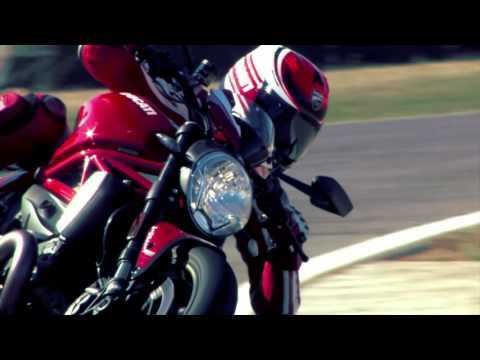 FULL-TFT INSTRUMENT PANEL: The Monster 1200 R is equipped with a state of the art full-TFT instrument panel. The display's configuration is variable and automatically adapts to variations in environmental light, also changing according to the selected Riding Mode or fully selectable by the rider. There are three configurations, different in background style, information displayed, and display layout: CORE view is preset for the URBAN riding mode: only the most essential riding information is displayed; FULL view, preset for the TOURING riding mode, provides the same layout as CORE with more information displayed; and finally TRACK view is preset for the SPORT riding mode, having crucial information more immediately visible such as an rpm bar graph. Monster 1200 R features a gear indicator in dash. Front - Tri-W spoke forged alloy 3.50 x 17 in. Rear - Tri-W spoke forged alloy 6 x 17 in.